Word of a new Marvel Vs. Capcom game could be heading our way in the coming months if rumors from website Team Spooky can be believed. And here's why I think they can: The poster over on Team Spooky saying that Marvel Vs. Capcom 3 is inbound is the same person who last summer leaked the entire Super Street Fighter IV roster and got it right. There's also my interview with Tatsunoko vs. Capcom: Ultimate All-Stars producer Ryota Niitsuma from earlier this year. 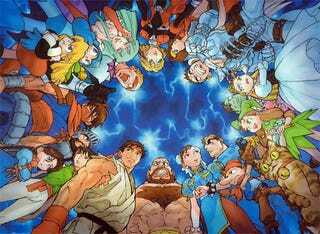 In it, Niitsuma says that a we could be hearing about a new versus game from Capcom this year. "I would love to do more versus series, more types of games like Marvel Vs. Capcom 2," Niitsuma said. "There are all of these possibilities working with other companies, seeing what we could do with them. There are so many game companies I'd love to work with. Also, there's Capcom's annual big news event happening next week in Hawaii. They've got to have something to knock our socks off with right? Don't worry, we'll be there live to deliver all of the news, impressions and interviews live from the island state.